Legendary Italian marque, Ducati is planning to introduce a new Multistrada in its existing lineup in 2018. As revealed, the capable tourer will be based on an improved chassis and be powered by a more powerful engine. In the motoring world, it will be renowned as the Multistrada 1260. The changes which will be witnessed in this upcoming are majorly done at the powertrain end. The Ducati Multistrada 1260 will use a 1260cc L-Twin motor that performs propelling duties on the XDiavel model in a different state of tune. On the Multistrada, the engine in question is claimed to develop 158bhp at 9500rpm and 129.5Nm of peak torque at 7500rpm. In association with noted Desmodronic Variable Timing (DVT) technology, the motor is liable to perform much better than the last iteration. Post alterations such as increment in piston stroke from 67.9mm to 71.5mm to enhance displacement capacity, the tourers will be able to get 85 percent of the torque below 3500 rpm from motor. All these alluring figures are obtained by inclusion of redesigned connecting rods, crankshaft and cylinder heads. Other than this, various changes are also made on the base of the new Multistrada 1260. The steel trellis frame now has been tweaked, rake angle increased from 24 degrees to 25 degrees, swingarm expanded 1.9 inches and the wheelbase also increased in length. The electronic package on the new Multistrada will comprise Ducati Safety Pack (DSP) and riding modes. Whereas, the standard Multistrada are available with an optional Ducati Quick Shifter system (DQS). Globally, Ducati is offering the 2018 Multistrada edition in four variants including the standard 1260 Multistrada, 1260 Multistrada S, 1260 Multistrada D-Air and the 1260 Multistrada Pikes peak edition. Expectedly, we can witness the emergence of all the mentioned variants in India at the price tag with a premium over the outgoing models. The Ducati Pikes peak gets the influence from the fabled American hill climb race, which is also known as “The Race to the Cloud’. Ducati has already received accolades for winning hill climb race thrice. Multistrada pikes peak is made on the technical detailing of Multistrada 1260S. The motorcycles get 1262 cc Euro 4 compliant Ducati Testastretta DVT engine, a slightly longer swingarm, and fresh chassis dimensions. The racer has a new color scheme, fresh aluminum wheels, Ohlins fork, Ohlins TTX36 shock fitment, which can be altered mechanically. Along with the silencer and nose fairing as standard, a carbon fiber Ducati Termignoni silencer and a carbon fiber screen of low racing-type are there to make a perfect combination. To uncover Multistrada spirit, it has hands free cover and front side panel, the front mudguard with carbon fiber components, and red-stitched seat. To scale up the performance and safety features, the bike is equipped with Bosch Inertial Measurement Unit (IMU), which actively calculates roll angles, pitch, and acceleration besides the 3 axes. When we peek into the specs in detail, the racer has Ducati Wheelie Control (DWC), Vehicle Hold Control (VHC), Cruise Control, ABS, Cornering Lights (DCL), and full LED headlights. Technical specification will make you fall in love with Pikes Peak as it has a standard Bluetooth module, the Ducati Multimedia System (DMS), multimedia functions (incoming calls, text messaging, music) while connecting with a smartphone, and the fresh graphics and logic in display information on the TFT dashboard. 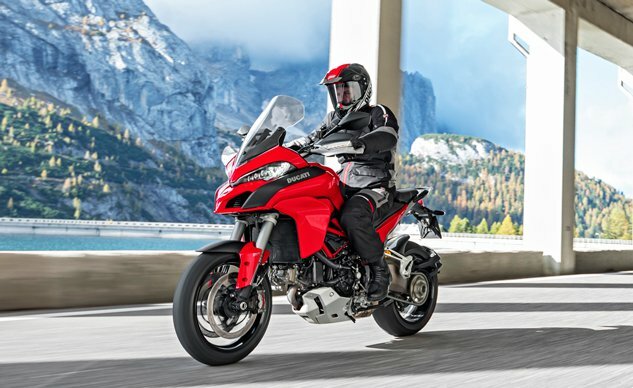 The Multistrada pikes peak is available in three accessory packages. The three packs are the Urban Pack includes USB hub to charge electronic devices, top case, and tank bag with tanklock,Touring Pack (including panniers, heated grips, and centre stand), and the last the Enduro Pack (additional LED lights and Ducati Performance components of Touratech: radiator crash bars, sump guard, engine crash bars, a wider kickstand foundation and off-road footpegs).